In contrast to the bustling boardwalks and vibrant nightlife of the northern Atlantic Coast, the barrier islands of North Carolina serve as a perfect getaway for visitors looking for southern charm and expansive stretches of undeveloped Atlantic Ocean beachfront. Popular vacation destination areas include the Outer Banks, a 200-mile stretch of barrier islands spanning the Currituck, Albemarle, and Pamlico Sound regions. Historic sites abound, including homages to the English Roanoke Colony, which was known as the home of the first European child born in the New World and vanished shortly thereafter. 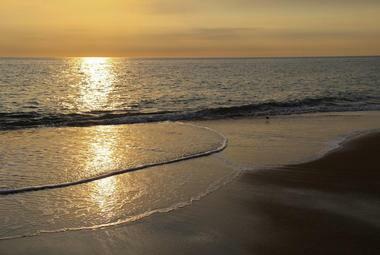 For visitors looking for quieter natural excursions, the 70-mile Cape Hatteras National Seashore, NC offers fishing, surfing, boating, shelling, camping, and unique wildlife watching opportunities. 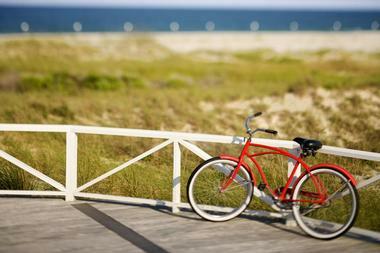 Bald Head Island is North Carolina’s southernmost settlement, located at the tip of Cape Fear in Brunswick County. Though the island served important roles in the American Revolutionary and Civil Wars, it is perhaps best known today as the primary location in the 1989 feature film Weekend at Bernie’s. Three lighthouses have serviced the island, including the out-of-commission Old Baldy Lighthouse, which was constructed in 1817 and is the state’s oldest extant lighthouse, offering tours today through the Smith Island Museum. The island is recognized nationally for its bird and sea turtle nesting populations and features 14 miles of gorgeous visitor beaches and attractions such as the Bald Head Island Club golf course, named the number two course renovation in the country by Links magazine. Many vacation rentals on the island provide complimentary temporary memberships to the Bald Head Island Club and the Shoals Club, which offer gourmet restaurants and marina access. Bird Island is an undeveloped barrier island along North Carolina’s southwestern coast that has been declared as a Dedicated Nature Preserve. 1,481 acres of the island’s land is protected as Bird Island Preserve, which is home to notable populations of loggerhead sea turtles and seabeach amaranth, both threatened species. Visitors may access the island by boat at the Little River Inlet or on foot from Sunset Beach, which offers parking at Main Street and the 40th Street Boardwalk. The island is a perfect spot for nature lovers, offering day-use public walking access throughout its maritime grassland, salt marsh, and dune beach ecosystems. Bodie Island’s name is misleading, as it has been joined to the Outer Banks peninsula since the 1811 closure of the Roanoke Inlet. Today, it connects Nags Head to Oregon Inlet and is maintained as part of Cape Hatteras National Seashore, which spans more than 70 miles along the Outer Banks region. Unlike the nearby tourist areas at Hatteras and Ocracoke Islands, Bodie Island is a largely undeveloped natural paradise, offering ample opportunities for activities such as boating, kayaking, fishing, and bird watching. The 10-mile island is also home to the historic Bodie Island Lighthouse, which was constructed in 1872, and the Oregon Inlet Fishing Center, one of the region’s largest fishing centers. Off-road vehicles are permitted on several beaches, and overnight accommodations are available at the NPS-managed Oregon Inlet Campground. Cedar Island is commonly used to refer to a group of mainland communities near Beaufort and Morehead City, though the proper island is a four-mile refuge located across West Thorofare Bay from mainland North Carolina. Much of the island is preserved as Cedar Island National Wildlife Refuge, which was established in 1964 and offers a wide variety of entertainment for nature lovers and beach buffs alike. The island is accessible via the Cedar Island Ferry route or NC Highway 12 and offers opportunities for boating, fishing, hunting, kayaking, shelling, bird watching, and horseback riding. As the closest region to popular Ocracoke Island, the island makes a perfect day trip or secluded getaway, offering both campground and motel accommodations. Emerald Isle was named for the lush green oasis it offered in the midst of the Crystal Coast’s sparkling waters and remains a beautiful refuge today. The island is also known as Bogue Banks Island and offers a wide variety of activities for every outdoor lover, including swimming, snorkeling and scuba diving, sailing, windsurfing, and kayaking. The Point offers a quiet beach haven and minimal crowds as compared to beaches on nearby resort islands, while the family-owned Salty Pirate Water Park provides thrills for young visitors. Other popular recreational spots include the Bogue Inlet Fishing Pier, the 41-acre Emerald Isle Woods Park, which features a disc golf course, and the secluded Cedar Street Park. Harkers Island is located approximately half an hour from Emerald Isle via US-70 and Harker’s Island Road. The island features an unincorporated community of residents known as “hoi toiders,” who speak a unique dialect of English and are descendants of original 18th-century settlers. Today, the island is a major center for waterfowl enthusiast tourism and is home to the Core Sound Waterfowl Museum and Heritage Center, which showcases waterfowl art and carvings. In December, the Core Sound Waterfowl Festival attracts more than 10,000 waterfowl enthusiasts to the island. Other notable sites include the National Park Service Visitor Center for nearby Cape Lookout National Seashore, which showcases a park documentary film and children’s activities. Hatteras Island divides the Pamlico Sound from the Atlantic Ocean and is the largest island within the Outer Banks region, spanning nearly 48 miles. With year-round mild temperatures, accessible beaches, and a wide variety of laid-back tourist activities, the island is the quintessential North Carolina getaway. The island is the primary site of the 72-mile Cape Hatteras National Seashore, which also spans nearby Bodie and Ocracoke Islands and offers eco-friendly outdoor activities such as boating, windsurfing, and kiteboarding. Seven villages on the island offer attractions such as the Graveyard of the Atlantic Museum, the Hatteras Island Ocean Center, and the Oregon Inlet Life-Saving Station, which is listed on the National Register of Historic Places. 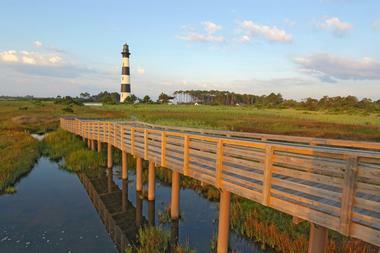 Other attractions include Cape Hatteras Lighthouse, which is the tallest extant lighthouse in the United States. Knotts Island is a small, marsh-filled island that is home to an unincorporated community offering true local charm. The island is surrounded by the North Landing River, Currituck Sound, and Knotts Island and Back Bays and is accessible from Virginia Beach via Princess Anne Road or by ferry from the mainland. Major attractions include the Swan Island Hunting Club, the Martin Orchard and Vineyard, which offers a public picking orchard and event pavilion, and the Bay Villa restaurant and bar, which is also home to the island’s main boat access ramp. Private seasonal equestrian lessons and children’s camps are offered at Willowgait Farm, and an annual Peach Festival is held on the island every year in June. Masonboro Island is North Carolina’s longest undisturbed barrier island, stretching 8.4 miles along the state’s southern coastline within New Hanover County. The island is preserved as Masonboro Island Reserve, which is overseen by the North Carolina National Estuarine Research Reserve and is designated as a North Carolina State Natural Area. Its natural ecosystems are a mix of dunes, marshes, and tidal flats and provide an important nesting area for threatened loggerhead sea turtles. Visitor access to the island is restricted to boat, kayak, and canoe travel, with private ferry service available from several ferry companies. Overnight camping is permitted at several sites throughout the island. Oak Island is the perfect destination for families looking for a classic North Carolina beach vacation, offering more than 60 public beach access points and seaside attractions such as old-time ice cream parlors and miniature golf courses. A number of historic sites are available for touring, including Oak Island Lighthouse, the state’s most recent lighthouse, constructed in 1958. Popular family attractions include the Oak Island Nature Center and the Ocean Education Center, which offer natural history exhibits and programming, and the community-supported Oak Island Skate Park. 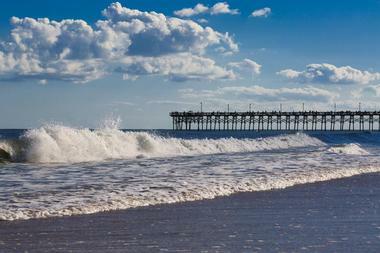 Two ocean piers span the island’s shoreline, including Oak Island Pier, the state’s tallest pier, and the Ocean Crest Pier, voted as the state’s top fishing pier. Parents can shoot the green at the Oak Island Golf Country Club, designed by renowned architect George Cobb, or tour the filming locations of feature films such as I Know What You Did Last Summer or Crimes of the Heart. Ocracoke Island is one of three islands that comprise the Cape Hatteras National Seashore, a 70-mile undeveloped national seashore managed by the National Park Service offering a number of secluded visitor beaches and opportunities for boating, fishing, surfing, and swimming. 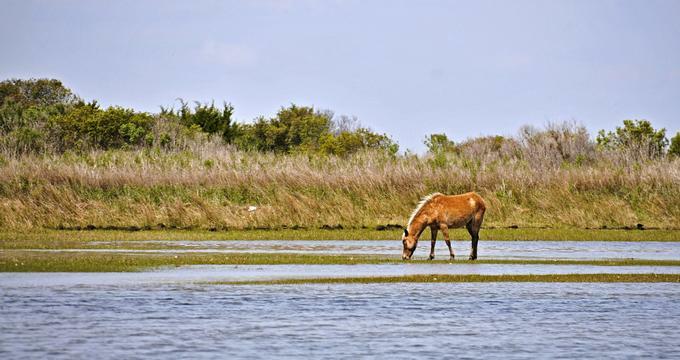 Lucky visitors can catch a glimpse of the island’s wild pony population, which are believed to be descended from mustangs owned by Spanish explorers. The island is accessible via several passenger ferries from the mainland and nearby islands and from the public-use Ocracoke Island Airport. A variety of eclectic locally-owned shops and restaurants are offered within the National Register of Historic Places-listed Ocracoke Village, located on the island’s southern end, which is also home to the Ocracoke Island Lighthouse, the state’s oldest operating lighthouse. Pleasure Island was formerly known as Federal Point before the 1930s completion of Snow’s Cut, which separated the island from its mainland peninsula. The island is home to the coastal cities of Kure and Carolina Beach and the annexed community of Wilmington Beach, which offer a variety of unspoiled beach areas and family attractions. Carolina Beach Boardwalk, which showcases classic amusement rides and boardwalk arcade games, has been named one of the top 10 boardwalks in America by Budget Travel and Food and Wine magazines. Other major attractions include Fort Fisher State Recreation Area, the North Carolina Aquarium at Fort Fisher, the family-friendly Ocean Front Park, and the Kure Beach Fishing Pier, one of the Atlantic’s oldest fishing piers. Roanoke Island is an eight-mile island near Nags Head that is accessible from the mainland via the Virginia Dare, William. B Umstead, and Washington Baum Bridges. As one of the oldest communities on the Outer Banks, the island was the site of the 16th-century Lost Colony, which has been immortalized in an eponymous outdoor symphonic drama offering seasonal performances at the 25-acre Roanoke Island Festival Park historic attraction. 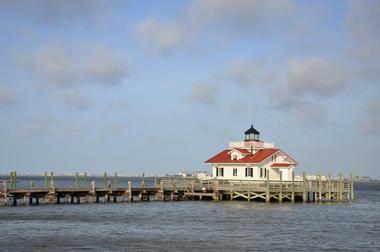 A variety of shopping and dining experiences are offered in the town of Manteo, located on the island’s northern end. Other major attractions include the Fort Raleigh National Historic Site, the Roanoke Island Aquarium, and the North Carolina Maritime Museum. Shackleford Banks are the southeasternmost part of the Cape Lookout National Seashore and are a must-see destination for nature lovers visiting the Crystal Coast. The 8.5-mile island is accessible from Harkers Island and mainland city Beaufort by a number of ferry services and formerly housed the Diamond City community. Since the 1960s, the island has been managed by the National Park Service and offers ample opportunities for shelling, surfing, fishing, paddle boarding, and kayaking. 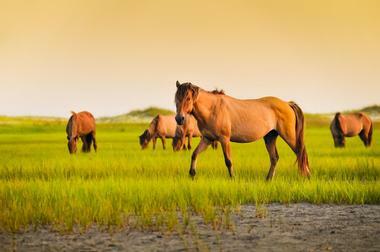 Wildlife enthusiasts can observe the island’s Banker Ponies population, believed to have descended from Spanish Mustangs that were shipwrecked in the 16th century, along with a variety of shore, water, and migrating bird populations. Topsail Island is a 26-mile island located along North Carolina’s southeastern coast that are believed to have been named for their early population of pirate ships, whose topsails were often visible from the open seas. In World War II, the island was home to an anti-aircraft training base that was converted into the Operation Bumblebee guided missile development base during the Cold War. Today, the island is home to three quaint communities offering locally-owned businesses, such as the Jolly Roger Fishing Pier, the Queen Jean headboat, and a number of restaurants and gift shops. Family-friendly attractions include the Topsail Island Skating Rink, the Patio Playground putt-putt course, and the Missiles and More Museum, which preserves the island’s military history.